From the half of the 17th century, three families in Nordhorn carry the surname Grijp, although their name were also written as Gryep, Grip or Griep. But when we look at their first names, they seem te be related. Nordhorn is part of the Countship of Bentheim, an area whithin Germany with a strict calvinistic religion. Unto the end of the 17th century, the language similar to Dutch was spoken in this region. The family branch that was first mentioned is that of Rolof Grijp. In his lineage the name Grijp seems to be disappeared after four generations. Rolof Grip lived in the middle of the 17th century. In the year 1634 his wife Fenne Küpers was noted as a citizen of Nordhorn and in 1674, as their son Rudolff marries, he is already dead. Rudolff Gryp, married to Engele Stavermans from Ootmarsum, was alderman and mayor of Nordhorn in the years between 1701 and 1714. His son Rudolph Grijp was born at Nordhorn in 1676. In 1708 he married Aleida Kramer, the daughter of the mayor of Ootmarsum. Between the years 1712 and 1739 he was successively mayor, alderman and 'loonheer' of Nordhorn. His brother Jan Grijp had positions as 'keurnoot', 'rotmeester', 'gemeensman' and 'loonheer'. Rudolph had two daughters, Engel Margaretha (born in 1709) and Aleid (1711), and a son Willem Grijp. This son was baptised at Nordhorn on September 17, 1713, he studied theology at Leiden and married on February 23, 1738, at Enschede with Geertruid Elshof, the daughter of the mayor. Willem Grijp was a merchant, and between 1740 and 1772 also mayor and alderman of Nordhorn. He died on April 25, 1780. Willem had three daughters: Alide (baptised in 1748), Gezina (1750-1784) married in 1770 at Losser to Johannes Stroink, owner of the cottonmill Katoenweverij J. Stroink & Zn at Enschede, and Herberdina Margaretha (1752-1795) married in 1789 at Nordhorn to Petrus Dannenbargh of Amsterdam. Nordhorn is first mentioned around the year 1000, when the city is noted as "Northornon" in a taxation registry of the abbey of Werden. In 1379 Count Bernhard I of Bentheim grants Nordhorn municipal rights. The prosperity of the city is demonstrated by the building of the 'Old Church', inaugurated in 1495 and still a prime symbol of Nordhorn. That also goes for the abbey 'Frenswegen', founded in 1394 by Augustine monks. In the same period there was also the family branch of Reiner Griep. 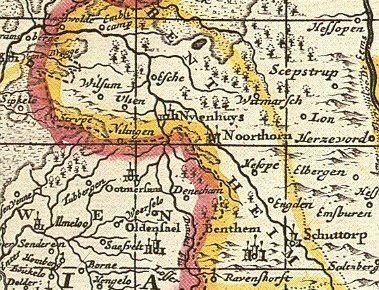 Most of his descendants stayed to live at Nordhorn, but also in this lineage the name Grijp seemed to have disappeared. Johan Reinersz. Gryp married around 1677 to Maria Tölners from Hopsten. Anna Catharina (1645-1733), who married in 1681 at Lingen to Geerd Joan Brummeleuw, is probably his sister. She lived at Lingen and had six children. Johan's son Willem Grijp married Aleida Striks. In 1715, as his wife is noted as the owner of a bakery in Nordhorn, he is already dead. His brother Anthonie Grijp is mentioned in 1710, 1716, 1719 and in 1724 in connection with different positions as a local official at Nordhorn. Willem had four sons: Jan Herman Grijp (born in 1708), Herman Grijp (1709-1782), first married to Margaretha van Dorsten and secondly in 1755 to Johanna Hambecke, daughter of the mayor of Bentheim; between 1740 and 1780 he holds several positions in the local government of Nordhorn, Jan Grijp (born in 1711) and Willem Grijp (born in 1714). Herman had one daughter: Margaretha Grijp, married in 1763 at Nordhorn to Pieter Theusink from Zwolle. In 1804 Margaretha lived at Schüttorp. 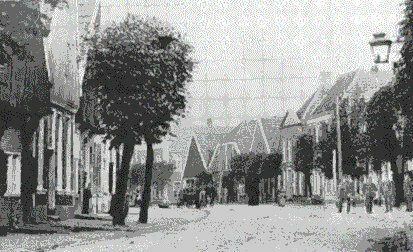 In the Countship Bentheim, of which Nordhorn is part, the main language was very similar to Dutch till the end of the 19th century. It was the calvinistic faith, in this region tightly connected to the Dutch Twenthe, that prevented the people to converse to speaking German, which was associated with the Lutheran faith. Initially neither the government of Prussia nor that of Hanover had the intention to force the people to speak German, but from the 19th century on this language was strongly promoted. In 1853 the Dutch language was abolished at the schools and at the end of the 19th century also in local government. Later on the Dutch language only played a role at home and in the church. The descendants of the third branch, that of Henrich Grijp, all moved to the Netherlands. They went to Amsterdam or became vicar in several places in Holland. Out of this family branch there also arose a family by the name of 'Specht Grijp'. Henrich Grijp was mayor, alderman and 'pachter van het mout en het klein gemaal' at Nordhorn between 1703 and 1732. His children were: Hendrina Johanna, (1699-1778), married to Hendrick Hermansz. Strick, citizen of Zwolle in 1725, coppersmith and lieutenant of the civil guard; Rudolf Grijp, married to Aleida Bode from Uelsen in 1730 and mayor and alderman of Nordhorn; and Henricus Grijp (1706-1747). Rudolf had four children: Barend Grijp; Margaretha, born around 1733 at Nordhorn and married in 1767 at Amsterdam to Jacob Vink; Johanna (1739-1795), married in 1771 at Amsterdam to Barend Johannes Bosman; and Hendrik Grijp, who in 1764 purchased the parental estate at Uelsen from his brothers and sisters, who all live in Amsterdam, for the amount of 2450 Dutch guilders. Henricus Grijp (1734-1783) is born at Metslawier, married in 1769 at Opheusden to Gerharda Wilhelmina Specht, and is a vicar; Egbert Grijp (1736-1795), born at Drogeham, becomes a citizen of Amsterdam in 1760, working as an officer at the tobacco custom house; and married in 1766 to Catharina van der Voort; Johanna Willemina (1739) and Lucas Grijp (1740), both born at Veenendaal; Henrica (1741-1816), born at Veenendaal in 1770, married to the theologian dr. Daniël Albert Reguleth from Amsterdam en buried in 1816 in the Church of St.Jacob at The Hague; Den Haag; Anna Geertruida (1741-1813) her twin-sister. Oldest son Henricus lived at Wageningen and had six children: Anna Geertruida Adriana (1773-1785); Jacoba Maria (1774-1846), married in 1802 to the notary mr. Gerhard Haesebroeck from Zutphen, who died in 1815; Henrica Catharina, born in 1776; Geertruida Clasina (1778-1785); Philippus (1781-1843) and Henricus Egbert Grijp (1784-1845), a broker from Rotterdam. "In red a golden griffin. On the helmet: a walking griffin. Covers in gold and red." "Divided in four: I and IV the coat of arms of Grijp; II and III three black woodpeckers ('specht') on a silver background ." Their son Philippus combined both of his parents surnames, and carried the name Philippus Specht Grijp. He married in 1809 at Vollenhove to the vicars daughter Catharina Sanders from Kuinre. After she died in 1820 he remarried in 1823 at Tiel to Catharina Elisabeth van der Pels from Amsterdam. Ds Philippus Specht Grijp is a vicar, at last at Tiel, and he died in 1843 at Drumpt. From his two marriages he left behind ten children Specht Grijp, and thus doing he is the ancestor of the Dutch family with that name. Apart from these three families, there are more people by the name Grijp that appear in the records of Nordhorn and the villages around it. As yet they do not fit in the famlily lines, although they seem to be related. Hendryck Gryep, alderman at Nordhorn in 1648 and 1649, married to Greet Haeseforths who at February 16, 1650 becomes a citizen of Nordhorn. Catharina Grieps (Gryp) from Nordhorn. She married in 1680 at Lingen to Johannes Probsting, receptor and organ-player at Lingen, and had eight children. Gerd Jan Grijp who, according to the Court of Law of Lingen at November 22, 1689, owed 32 rixdollars to Otto Wesken. Reindert Gryp, young man from Hesepe, married on June 7, 1695, at Lingen to Anna Hengenas from Wachendorf. Reinhard Wilhelm Grijp, in 1711 referred to as a local official of Nordhorn. Jan Hendrik Grijp, referred to as a local official of Nordhorn in the years 1712 and 1718. Do you have more information about the Grijp family from Nordhorn, or are you one of their descendants yourself? Please look on the page 'how to participate' how you can contribute to this project or send an email to jan.griep@planet.nl. on November 4, 2006, by ©Jan Griep, Katwijk aan Zee, The Netherlands.